The health benefits of omega-3 are well known, and now researchers have found that the omega-3 fatty acid docosahexaenoic acid (DHA) can reduce growth in some cancer cells. Cand.scient. Caroline Hild Pettersen and colleagues at the Department of Laboratory Medicine, Children’s and Women’s Health (LBK), NTNU, have studied omega-3 fatty acids (DHA and EPA) to see how they affect the growth of cancer cells, and what mechanisms are involved. She has found that omega-3 appears to reduce the growth of human colon cancer cells (SW620) and leukemia cells (HL-60). It also seems that DHA can have a positive effect on several target proteins for chemotherapy in colon cancer cells, but this however, requires further research. At the same time as some cancer cells are affected by omega-3, research also shows that other cancer cells can remain unaffected – probably due to the different genetic make-up of various cancer cells. ER is an organelle in the cell, which main task is to produce proteins, lipids and regulate the calcium levels in the cell. When these mechanisms are disturbed and the system becomes imbalanced, you get ER stress. While the cell tries to rebalance the system, cell growth is temporarily stopped – a cell cycle arrest occurs. If the rebalancing fails, ER stress can lead to cell death (apoptosis). “We have shown that some cancer cells are sensitive – their growth is restricted when subjected to omega-3 fatty acids – whereas others are not sensitive to omega-3. Our goal is to find out which mechanisms are affected by omega-3 fatty acids; and we are the first to show that omega-3 fatty acids activate a signaling pathway that is involved in normal stress response (ER-stress) in cancer cells,” Pettersen says. ‘Normal amounts’ of omega-3 is not damaging to healthy cells, and the amounts of omega-3 used in the research correspond to an easily obtainable amount in the body through omega-3 dietary supplements. 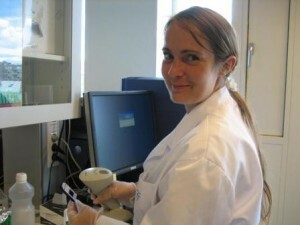 Pettersen’s PhD thesis consists of three articles based on gene expression analysis where the cancer cells were treated with omega-3 fatty acids, and where the researchers have studied genes which change their expression after treatment, to try and identify how biological pathways and mechanisms are affected. In the first article Pettersen shows that DHA leads to changes in a molecular pathway called ER stress (see fact box) in the colon cancer cell SW620, which resulted in a slowing-down of cell growth. The researchers also found that the calcium- and cholesterol balance was changed after treatment with the omega-3 fatty acids – and such imbalances can also lead to ER stress. By studying the effect of omega-3 fatty acids in cancer cells that are resistant to certain changes in calcium levels, the researchers have shown a correlation between changes in calcium levels in the cancer cells and the activation of ER-stress. It is therefore probable that the growth-inhibiting effect of omega-3 fatty acids is due to changes in the calcium levels in the cancer cells. The study with colon cancer cells also showed that the same proteins that are target proteins for chemotherapy were affected by omega-3. This indicates that omega-3 in some cases can aid chemotherapy, but this requires further research, Pettersen warns. DHA induces ER stress and growth arrest in human colon cancer cells: associations with cholesterol and calcium homeostasis. Jakobsen CH et.a. J Lipid Res. 2008 Oct;49(10):2089-100. Epub 2008 Jun 19. The antiproliferative effect of EPA in HL60 cells is mediated by alterations in calcium homeostasis. Slagsvold et.al. Lipids. 2009 Feb;44(2):103-13. Epub 2008 Nov 20. DHA alters expression of target proteins of cancer therapy in chemotherapy resistant SW620 colon cancer cells. Slagsvold, et.al. Nutr Cancer. 2010;62(5):611-21. The research is still ongoing, and the scientists continue to look for mechanisms that are affected by omega-3 fatty acids in different types of cancer to see if there are any common denominators for the sensitivity towards omega-3 fatty acids. “In the future omega-3 fatty acids could become a supplement to cancer therapy, but it will take a long time to clarify this possibility,” Pettersen says. Pettersen will defend her thesis: “The effect of omega-3 polyunsaturated fatty acids on human cancer cells – molecular mechanisms involved” on Thursday 14. June, at 12.15 in the Auditorium, Medisinsk Teknisk Forskningssenter. The trial lecture “Potential benefits of omega-3 against non-cancerous chronic diseases” will take place at 10.15 in the same room.